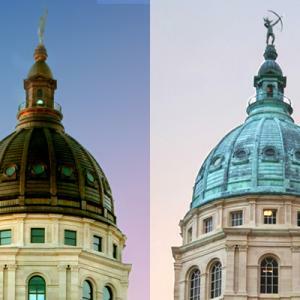 The old copper dome, which became coated with a green patina over time, has been replaced with new copper, which will keep its shiny penny color for 40 to 50 years. Get a close-up look at a large dome window - removed from the outer dome during the restoration - in the northeast room of the ground level by the dining room. 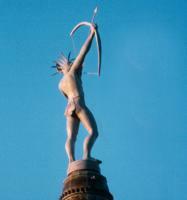 A sculpture of a Kansa Indian warrior aiming an arrow to the North Star was placed on top of the dome in 2002. The title of the statue, "Ad Astra," is taken from the state motto, Ad Astra per Aspera, which means "to the stars through difficulties." Hollow cast of silicon bronze, Ad Astra is 22 feet 2 inches tall and weighs 4,420 pounds. 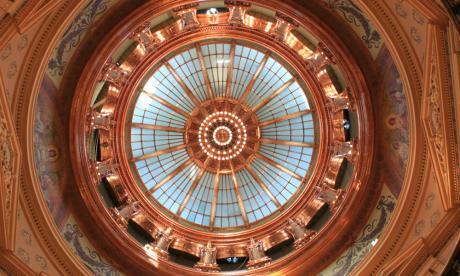 Part of the stunning skyward view from the center rotunda, a replica of the original chandelier has been installed. 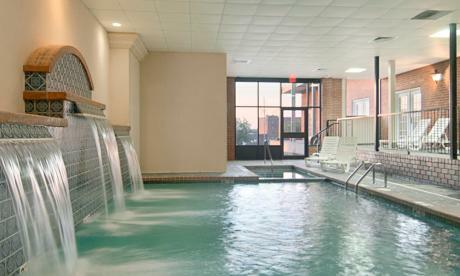 The original fixture was removed and donated to a scrap metal drive during World War II. 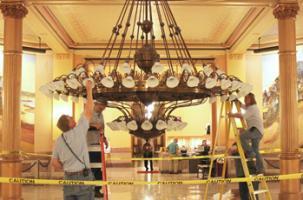 The chandelier can be lowered all the way to the rotunda floor for maintenance and repair, as in the picture above. 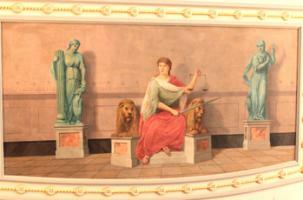 The Capitol contains many impressive murals, but “Tragic Prelude” by John Steuart Curry is the most famous. 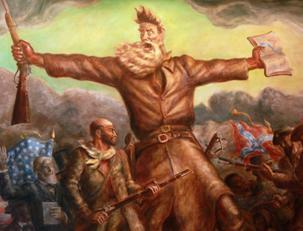 The painting features the larger-than-life abolitionist John Brown, with arms outstretched, holding a gun and a Bible and surrounded by proslavery and antislavery forces. 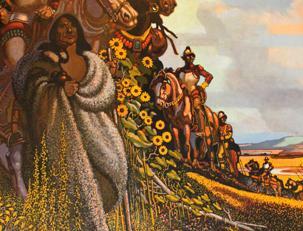 Often used as an illustration to pre-Civil War struggles in Kansas, this mural has been used in many history books and as album art for the 1974 self-titled album from the rock band Kansas. 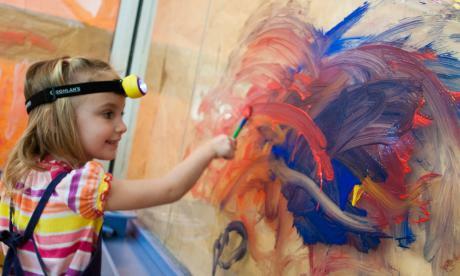 During the renovation, beautiful frescoed ceiling murals were discovered under layers of paint. The murals - representing justice, history, law and liberty - were probably painted over to eliminate the cost of maintaining the art. They have been restored now for all to enjoy. 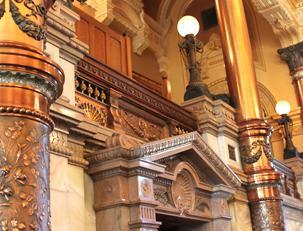 Learn more about the House of Representatives Hall. Housed in the east wing - the oldest section of the Capitol - the ornate Senate Chamber is decked out in cherry wood, bronze and copper columns and stately marble. Rich in details, the massive columns were hand-cast in Italy and the unique plaster ceiling was inspired by Egyptian design. 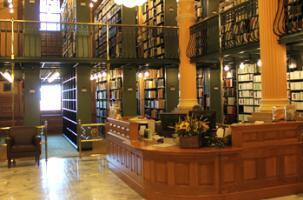 Even before Kansas&apos; official statehood, the State Library served as a depository of legal and historical documents and as a ready resource to the executive and legislative branches of Kansas government. 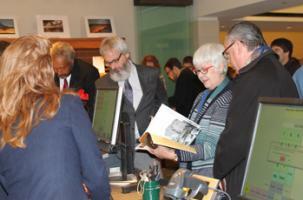 Today, the State Library serves as a resource to all. Don&apos;t miss walking on the original glass floors on the library&apos;s second story. 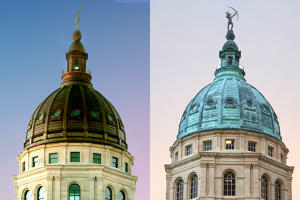 Many murals, statues and photographs line the halls of the Statehouse illustrating important points in Kansas history. In the first floor rotunda, find David H. Overmyer&apos;s eight scenes from Kansas history including The Coming of the Spaniards, pictured above. 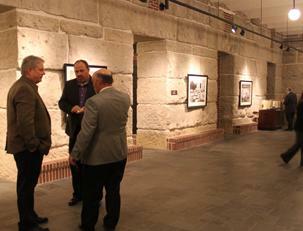 Eight scenes in the second floor rotunda by Lumen Martin Winter depict history, agriculture, industry and education. Pete Felten created four sculptures of famous Kansans that are displayed in the second floor rotunda of Arthur Capper, Amelia Earhart, Dwight Eisenhower and William Allen White. A stroll around the capitol grounds reveal several sculptures including two by Robert Merrell Gage: Abraham Lincoln: Man of Sorrows and The Pioneer Mother and Child. 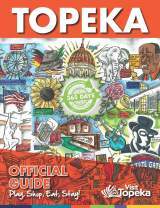 The Capitol Store features great Kansas-made gifts and souvenirs including books, photographs, collectibles, jewelry, toys and food products. Available only at the Capitol Store, take home a piece of the old Capitol dome in the form of fine jewelry, art and collectibles made from copper that was removed. 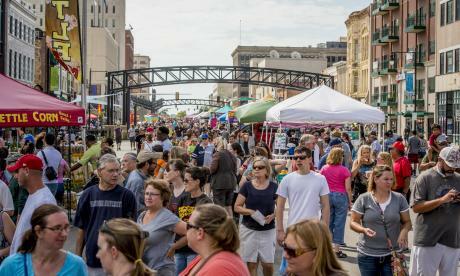 Kansas artists have created one-of-kind works of art from that familiar green copper that was part of the Topeka skyline. 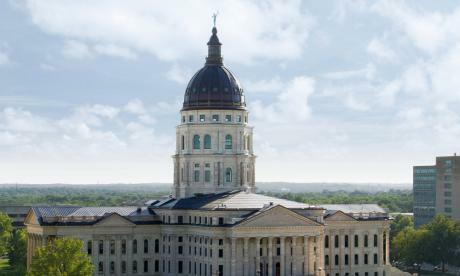 The new Capitol Visitor Center connects the new public entrance with the historic Statehouse and displays objects from the Kansas State Historical Society including John Brown&apos;s sword, the Wyandotte Constitution and photos of famous Kansans. An auditorium and classroom have been added to accommodate the many group tours conducted in the Capitol. To make room for the visitor center, construction workers dug below the building to expand what was previously a basement. Watch for the transition from new, smooth limestone, to old textured stone as you walk into heart of the building.